Casinos running the innovative Rival Gaming software tend to be smaller outfits, and over the years several of these have become ‘rogue’ following issues with payments. Slots Capital not only has all the iSlots and other Rival games – they have the highly regarded Casino Meister seal of approval too. Licensed in the Netherlands Antilles and run by the reputable Deck Media Group, Slots Capital welcome players from the US as well as catering to an international audience. 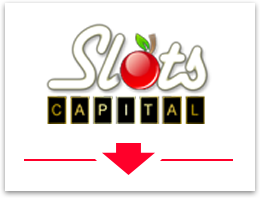 This review covers all the information you need to get the best from Slots Capital including: Games overview, Bonuses ($7 no-deposit plus welcome deals), device compatibility and my comparison with other popular casinos. Rival Gaming powers the Slots Capital casino with more than 100 slots and a smaller selection of table games and video poker. The slots are the main attraction from Rival. They have created real mix of titles. Top of the list are the cutting edge (and definitely unique!) iSlots range, which have storylines which develop as you play them – in the form of progressive bonus rounds. 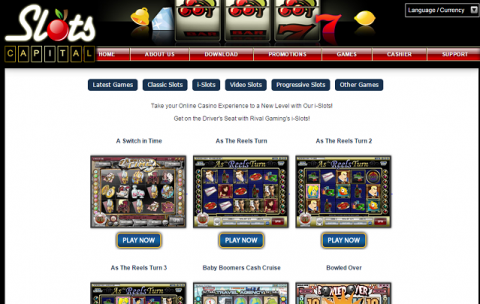 There are also standard video slots and colorful 3 reel slot games, many with bold themes. In general I prefer Rival titles to Real Time Gaming slots. While the graphics do not match up with the BetSoft titles, the bonus features keep the games interesting for a lot longer. There are more than 20 iSlots to choose from already, with new titles released every couple of months. If you are new to these then I recommend starting with ‘As the Reels Turn’. This makes the crazy idea of a soap opera crossed with a slot into reality, with the action based around a nightclub. There are 3 parts to this, with bonus rounds and video clips moving the story forward as you play. Here are the reviews for Part 1, Part 2 and Part 3. Other iSlots are more standard themes, with a personal favorite being the golf themed games (the latest one ‘The Back 9’ is excellent) - and the space-themed Cosmic Quest. 100 brand new slots at a casino that welcomes US players adds a huge selection to the same old RTG titles. Some of these are getting on a bit, while others are sharp and modern. You will find break out features and free spin rounds on the 5 reel games – though not at the same level as the iSlots. Check out For Love and Money or Scary Rich 2 for an introduction to the general slots range. There are 5 slots with progressive jackpots in the Rival Gaming range, including the excellent 3-reel game Strike Gold. While the pool will not beat those from MicroGaming et al, it is often in the 6-figure range. Check out www.slotscapital.lv to see the latest jackpot pool. Compared to the slots list, the number of table games is much smaller. All the favorites are in place, though you will not find too many variations of each. The list includes US and European Roulette, Single and Multi Hand Blackjack, Baccarat, Pai Gow, 3 Card Poker and Caribbean Stud. There are also 7 video poker titles, and some ‘specialty games’ which including Keno and Scratch-Card type titles. I found these loaded quickly (instant play mode) and were very smooth, though simple graphically – especially compared to the big international software developers. Welcome bonuses at this casino are generous – as long as you keep to their (strict) rules. You can claim $7 in free play with no deposit needed. This has a 40x play-through via slots with your winnings capped at $50. It is a great way to try out the iSlots without committing any of your own cash. The play-though does shrink with each bonus, which is a nice touch. Note that this is the slots bonus, and playing other games can void the offer. You also have a restriction of $6.50c per spin, going above this can also void the bonus. Note that this play through is calculated based on deposit + bonus combined. Table games players will find 2 bonuses with a 100% and 50% match totaling $1000. These have a 25x and 22x play-through, and no maximum cash out. Permitted games are weighted at 25%, which compares favorably to many other casinos. You will need to claim bonuses in the cashier before you deposit. Regular play is rewarded with a comp point scheme. You need to apply for this (send a mail). This includes reloads, a 5% rebate on losses each month and even a present on your Birthday. There is a download for Windows, which includes the full suite of 150+ games. You can also play the in-browser suite, which has 100+ (more added all the time) titles. Rival slots work using both Flash and HTML5, which means they will load on iPads as well as Android / Windows tablet devices. These games will work on mobiles, though were not created for these devices and do appear small. I recommend you test them on smartphones / iPhones using the free play option before you deposit if this is your only device. I like this casino. While there are some rules ($6.50 max bet for bonuses, don’t play table games with the slots bonus), the incentives are generous and the casino has the trust of the industries main watchdog with the casino Meister seal. If you have not yet checked out the iSlots, then these are definitely worth a look. Many players love the progressive ‘story’ bonus founds and interactivity of these. If nothing else they make a great change for US players tired of the same old RTG titles. Table games could feature more choices, though you’ll find the favorites are all in place. All in all a solid Rival Gaming outfit – grab your free $7 over at www.slotscapital.lv now!